On October 3, 2015, there will be major changes implemented in residential mortgage lending that will greatly assist mortgage consumers, mortgage bankers, and REALTORS® alike. TRID, which stands for TILA/RESPA Intergraded Disclosures, changes will heavily focus on ensuring the disclosure of accurate data in specific time-frames regarding expected, and final, costs to the consumer. These major changes will also provide a completely different format to the currently confusing Good Faith Estimate (GFE) to a much more consumer friendly format of loan costs disclosure called the Loan Estimate (LE). In addition, we will see the final HUD document changed to a more easy to read document called the Closing Disclosure (CD). The biggest benefit to the new CD is that it will have to be disclosed to, and received by, the consumer at least 3 business days prior to closing. This will eliminate the stress for everyone involved in the transaction that used to come from receiving the final figures only one day prior to closing (which is the current RESPA compliant standard). TRID calls for a zero-tolerance policy to these newly highlighted time frames of document disclosure and receipt. As a result, now more than ever, it is critically important that all parties communicate often and accurately in the early part of the mortgage process to ensure a smooth and timely closing. I am happy to report that Leader Bank has already embraced these timing-specific changes, ensuring we are ahead of the curve in continuing to provide excellence and distinguished residential Mortgage Lending services to our clients and business partners alike. To learn more about TRID changes, or more about my services as a direct lending Mortgage Banker, please feel free to contact me at any time. 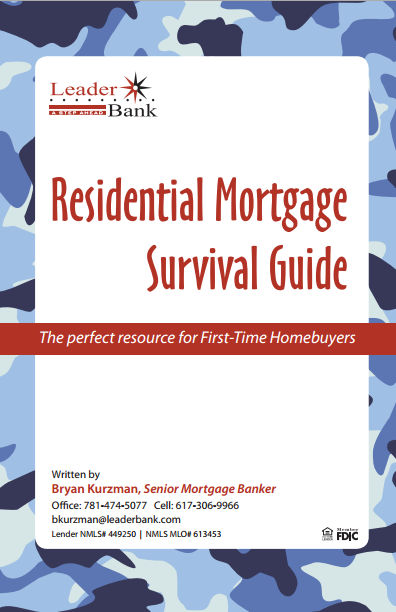 For more in residential mortgages, download a complimentary copy of Bryan's Mortgage Survival Guide.